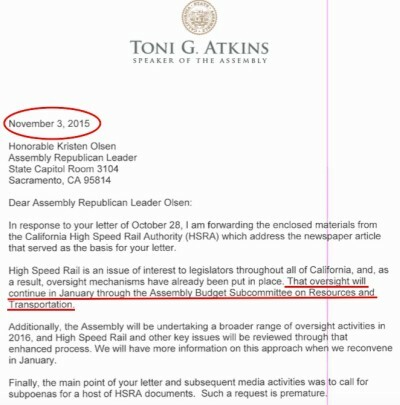 Contrary to the claims of the taxpayer-funded California High-Speed Rail Authority Communications Department, the summer of 2017 was grim for the future of California High-Speed Rail. 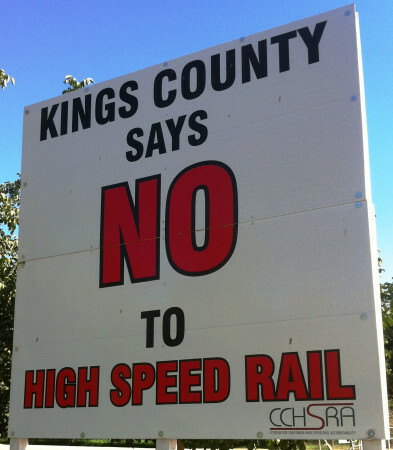 Citizens for California High-Speed Rail Accountability (CCHSRA) continually tracks developments (or lack of developments) for this costly, misguided high-speed rail plan. We see several trends ongoing with this project. The first is Lack of Leadership. Somehow, Los Angeles Times reporter Ralph Vartabedian was able to get a document “for internal use only” that top Federal Railroad Administration officials reportedly gave to top California High-Speed Rail officials at a December 1, 2016 meeting in Washington, D.C. 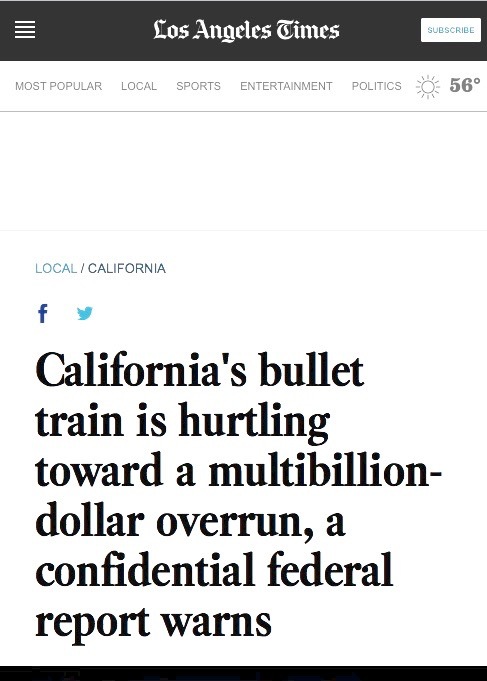 He reported on this “confidential” document today (January 13, 2017): California’s Bullet Train Is Hurtling Toward a Multibillion-Dollar Overrun, a Confidential Federal Report Warns. This report claims that the Initial Construction Segment of California High-Speed Rail (apparently identified as Merced to Shafter rather than Madera to Shafter) would cost $9.5 billion to $10 billion instead of the assumed $6.4 billion. It also will not be completed until 2024 instead of the planned 2018. Finally, the report concludes that the California High-Speed Rail Authority may not be able to achieve the conditions required to qualify for federal American Recovery and Reinvestment Act (ARRA) stimulus grants awarded in 2009 and 2010. This means California taxpayers would be alone in paying for it. Presumably this report only refers to the laying of track in the San Joaquin Valley and does not include electrification. At this time the California High-Speed Rail Authority had not even begun the bidding process toward Construction Package 5 – laying track on the Initial Construction Segment. Contractors for “Construction Package 1” are now working on demolition and civil engineering, including a viaduct near Madera. Aaron Fukuda, co-chairman of Citizens for California High Speed Rail Accountability (CCHSRA) was a guest on the Ray Appleton Show (with substitute hosts Blake Taylor and Michael Reed) on KMJ News/Talk 580AM/105.9 FM in Fresno on January 13 to talk about the boondoggle. Also calling in to decry the insufficiency of state oversight on the project was California State Senator Andy Vidak. And a statement from California Congressman Jeff Denham criticizing the project was referenced during the show. This cost overrun and delay is not surprising to Citizens for California High Speed Rail Accountability (CCHSRA). Nor is it surprising that the California High-Speed Rail Authority is downplaying the report. That state agency continues its quest to take land from San Joaquin Valley farmers, homeowners, commercial and industrial businesses, places of worship, non-profit groups, and even homeless shelters. It wants to lock up the land for a time when state tax increases provide enough funding to pay for completion of the San Joaquin Valley track. What Californians may end up getting for their $10 billion is a winding dedicated track for Amtrak diesel engines to cart passengers between Madera to Shafter. Is this what 53% of California voters envisioned when they voted for Proposition 1A in November 2008? Governor Jerry Brown and his political allies, led by construction trade unions, have ramped up a major campaign to defeat Proposition 53. This statewide ballot measure could jeopardize future funding prospects for California High-Speed Rail. Proposition 53, also known as the “No Blank Checks Initiative” would require voter approval for the State of California to sell a total of more than $2 billion worth of revenue bonds for a project. Unlike “general obligation bonds,” which are repaid (with interest) through state income and sales taxes, revenue bonds are repaid (with interest) through fees, fares, tolls, or other payments for services. The Delta farmer who funded the placement of Proposition 53 on the ballot and is funding the campaign to pass it was mainly inspired by a desire to stop Governor Brown’s controversial “Delta Tunnels” project. But Proposition 53 could also hinder future efforts by the State of California to borrow money for California High-Speed Rail construction and operation. Voters fed up with the continuing expenses for high-speed rail could potentially reject the sale of revenue bonds and cut off a source of state funding. An effective opposition argument to the sale of revenue bonds for California High-Speed Rail would probably focus on the exaggerated projections of ridership and fare revenue for the high-speed passenger train system. California High-Speed Rail is frequently mentioned in the news media as a project that could be jeopardized if Proposition 53 passes on November 8. For example, the October 14, 2016 San Francisco Chronicle article about Proposition 53 was titled “Prop. 53 Could Bring Big Projects to a Halt” and featured a frequently-published photo of CCHSRA allies Kevin Dayton and his daughter picketing at the high-speed rail groundbreaking ceremony in Fresno in January 2015. Proposition 53 will STOP POLITICIANS FROM ISSUING BLANK CHECK DEBT to complete billion dollar state boondoggles. Take California’s bullet train. They told us it would cost California taxpayers $10 billion. Now we know it’s going to cost more than $60 billion! Yet, you don’t have a right to vote on that huge increase! Leading opponents of Proposition 53 are construction trade unions, which have a monopoly on construction of the California High-Speed Rail system through a Project Labor Agreement. The State Building and Construction Trades Council of California; the Carpenters, Laborers, Ironworkers, and Operating Engineers unions; and the California Construction Industry Labor-Management Cooperation Trust have been top funders of the campaign to defeat Proposition 53. The rebuttal to the argument against Proposition 53 in the California Official Voter Guide states that opponents “include insiders who profit from massive state revenue bond projects, and politicians and bureaucrats who don’t trust you to decide whether to approve boondoggles like the $64 billion bullet train…” Some people would declare that to be an accurate depiction of the chief backers of California High-Speed Rail. The September 12, 2016 issue of The Weekly Standard magazine includes an excellent article about California High-Speed Rail and how it is affecting San Joaquin Valley communities. CCHSRA recommends that you read this article and share it on social media. As it surveys opposition throughout the state to the bullet train, the article cites the Citizens for California High-Speed Rail Accountability (CCHSRA). It also profiles and quotes CCHSRA members and friends who are defending their property rights from the California High-Speed Rail Authority. Our region is described as “geographically, topographically, demographically, and culturally far away from the bustle of the two coastal metropolises that the train was supposed to be designed to serve.” But as the reader learns, the first cut of the rail alignment diagonally bisects our fields and undermines our rural agricultural life. On May 16, 2016, the Federal Railroad Administration and the California High-Speed Rail Authority revised their agreement for $2.6 billion in federal funding from the American Recovery and Reinvestment Act of 2009 (ARRA) for the High-Speed Passenger Train for the 21st Century. In a California High-Speed Rail Authority press release dated May 18, 2016, the Authority CEO claimed that “High-speed rail construction is underway in California and this agreement is consistent with our efforts to connect Silicon Valley and the Central Valley by 2024, and then move forward with connecting San Francisco to Los Angeles.” Those “efforts” were just adopted by the Authority board on April 21, 2016 as the California High-Speed Rail Authority 2016 Business Plan. This revised plan anticipates high-speed passenger trains running on electrified track between the Central Valley and San Jose by 2025. The 2014 Business Plan had anticipated high-speed passenger trains running on electrified track running between the Central Valley and the San Fernando Valley by 2022. A May 18, 2016 article in Politico quoted the CEO as saying “Early on, there was a vision, but no clear sense of how to implement that vision…We have that now, and we’re moving ahead aggressively.” Central Valley residents are surprised to learn there had not been clarity in how to implement a vision, considering that the Authority has tried for several years via negotiations and eminent domain to acquire private property for the supposed implementation of a vision. Proposition 1A was approved in November 2008. The federal grants were awarded in 2010. As of today (June 2, 2016), the Authority has not even issued a Request for Qualifications for track between Madera and Shafter (Construction Package #5) and there is no schedule yet for bidding on electrication or a heavy maintenance facility coveted by local governments in the San Joaquin Valley. Construction has been limited to a viaduct, the demolition of structures and a street bridge in the City of Fresno, and some token archeological investigation. Federal Railroad Administration officials assigned much of the blame for the lags to the project’s vociferous critics, who have tied it up with a tangle of lawsuits, administrative challenges, and other red tape. They complained that the opponents, especially Central Valley farmers and other not-in-my-back-yard landowners, have gotten far more traction against the railway than they would have against a highway, reflecting a cultural and political bias in favor of traditional asphalt infrastructure. But while they described today’s agreement as a routine bureaucratic clarification, they said they expect an explosive reaction from opponents looking to score political points in Sacramento and Washington. 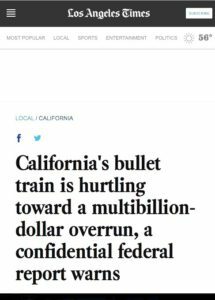 There will always be politicians and special interest groups who will blame any California High-Speed Rail failures on ordinary citizens who exercise their rights to bring public accountability to this boondoggle. Advocates of the high-speed rail often express resentment about being subjected to checks and balances inherent in the United States Constitution and the California Constitution. But the truth is that the legislative branch and the executive branch have generally ignored opponents, and the judicial branch has mostly rejected legal arguments from opponents. The real cause of the delays is the flawed language in Proposition 1A approved by 53% of California voters in November 2008. That ballot measure made promises to voters that it could not possibly keep. Since then, the California High-Speed Rail Authority and Governor Jerry Brown have used every trick in the book to keep the taxpayer money flowing and their patrons happy. (The funding comes from the annual state budget, particularly through cap-and-trade taxes.) Meanwhile, the self-declared author of Proposition 1A continues to receive awards and acclaim for putting out the bait while the switch goes on in Sacramento. Our long title was deliberate and revealed something few people know: the California High-Speed Rail Authority was authorized by Proposition 1A to spend almost $1 billion of borrowed money on “connectivity” projects. The State of California had already borrowed that money through bond sales to investors, and the state legislature appropriated the money to various state and local agencies for expenditures such as new train cars for the Bay Area Rapid Transit (BART) commuter rail. Our alternative Business Plan served as a comprehensive centralized source of organized data that the public could not find elsewhere. In preparing our version of the Business Plan, CCHSRA determined that the California High-Speed Rail Authority did not comply with state law and actually COULD NOT comply with state law in preparing its official Business Plan. Perhaps that’s why the official Business Plan appeared to be a promotional marketing piece. Nevertheless, the CCHSRA alternative Business Plan and comments submitted by hundreds of other Californians served as an outlet for public frustration and set a foundation for anyone wanting to add a new lawsuit to the many lawsuits filed against the California High-Speed Rail Authority. In a few cases, the California High-Speed Rail Authority revised its 2014 Draft Business Plan because of constructive public comments. What were the comments submitted to the California High-Speed Rail Authority about its 2014 Draft Business Plan? Here’s what was submitted through April 10, 2014, when the board approved the draft (with some minor changes) to be sent to the California State Legislature. I classified the comments based on three perspectives: critical, concerned, and supportive. Several members of Citizens for California High Speed Rail Accountability (CCHSRA) attended the February 11, 2016 Sacramento County Superior Court hearing in Tos v. California High-Speed Rail Authority. From throughout the state, critics of the current high-speed rail project joined CCHSRA members in the courtroom to watch oral arguments in this pivotal lawsuit for the People of California. Along with CCHSRA, John Tos and the County of Kings contend that the Authority has failed to comply with Proposition 1A. This is the ballot measure, approved by 53% of California voters in November 2008, that authorized the state to borrow $9.95 billion to start building the high-speed train system. Attorneys Stuart Flashman and Mike Brady came to the hearing prepared to make this case for Mr. Tos and Kings County. They refuted many of the claims of the state attorneys representing the California High-Speed Rail Authority. Prop 1A as presented to voters contains much more than just an authorization for the state to issue bonds. It sets specific criteria for the construction and operation of the system itself. For example, Prop 1A requires the train to be capable of traveling between San Francisco and Los Angeles in 2 hours and 40 minutes, with five minutes between each train. Authoritative studies and analyses (for example, from Caltrans) indicate that the mandates of 2 hour, 40 minute travel time and five minutes between trains cannot be achieved under the blended plan. And the slower and less frequent trains under the blended plan mean that ridership and revenue projects do not achieve the Prop 1A guidelines either. Studies and analyses produced for the California High-Speed Rail Authority to demonstrate compliance with Prop 1A are based on erroneous, unlikely, and untested assumptions. 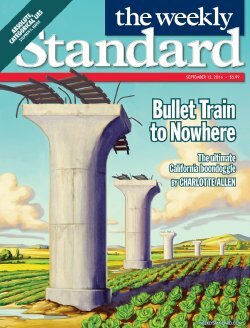 California High-Speed Rail was portrayed to voters as a dedicated track system, not a “blended” system in which the high-speed train shares track with commuter rails (Caltrain and Metrolink). There are no references to a blended system in the 2005 and 2008 Environmental Impact Reports related to the project. The 2012 legislative mandate for the system to share track with commuter rail was a novel development that surfaced after Prop 1A was enacted by voters. If the California legislature or the Authority wants to deviate from Prop 1A, they need to ask voters to authorize those changes. Prop 1A was a constitutional measure that cannot be altered by simple legislative action. Like in Phase 1 of this lawsuit, it is premature to claim that Prop 1A guidelines can’t be met. The Authority was required to develop a blended approach by the legislature. This plan served the public by reducing the cost of Phase 1 from $98 billion to $68 billion. There is a lot of evidence in the administrative record showing that the Authority can meet the requirements of Prop 1A. The court needs to defer to the decisions of the experts of the agency working on the project. Parties to the lawsuit are inappropriately challenging experts. When the judge asked the Authority’s attorney what would happen if the court determined that the Authority could not fulfill the Prop 1A travel times, the attorney responded that it would be the fault of the legislature, not the Authority. A ruling is expected in 60-90 days. Below is a summary (abstract) of a report submitted to the California High-Speed Rail Authority board by Mark R. Powell of Against California High Speed Rail at the board’s November 9, 2015 meeting. The Authority’s most recent hyping of the need for high-speed rail, a June 2015 brochure entitled California High-Speed Rail Big Picture (2015), makes the claim that Phase 1 Blended, connecting San Francisco and Los Angeles, provides a transportation capacity equivalent to 4,300 new highway lane miles, 115 additional airport gates, and four new airport runways costing $158 billion. A second claim is that high-speed rail provides this capacity at half the cost. This paper dissects these deceptive claims where the Authority uses “capacity” instead of “ridership” knowing full well that the theoretical capacity of Phase 1 Blended will dwarf its ridership and that the itemized highway lane miles will not be necessary this century, if ever, whether Phase 1 Blended is built or not built. The paper then traces the evolution over two decades of the asserted highway beneﬁts of high-speed rail, from the thousands of miles of highway lanes reported in the Authority’s 2005 California High-Speed Train Final Program EIR/EIS, back to earlier minimal assertions made in its first business plan and those made by its predecessor, the Intercity High-Speed Rail Commission. Lastly, this paper looks at California Department of Transportation (Caltrans) traffic data and Caltrans long range planning documents. The data and planning documents prove how the Authority grossly overestimated future highway infrastructure needs for the year 2016 in its 2005 California High-Speed Train Final Program EIR/EIS and attempts to give readers information sufficient to see for themselves high-speed rail’s true impact on future highway needs over the next 20 years. Read the full report at the California High-Speed Rail Authority website at Pushing Back on the California High-Speed Rail Authority’s Myths About High-Speed Rail or at the Citizens for California High-Speed Rail Accountability website at Pushing Back on the California High-Speed Rail Authority’s Myths About High-Speed Rail.